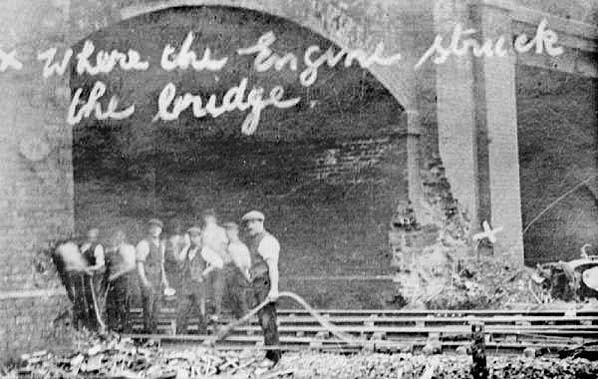 Hale Road overbridge showing the damage that was caused by the fatal crash that took place here on the 17th September 1912. A Chester to Liverpool Train hauled by a Precedent 2-4-0 No. 1529 Cook and comprising seven coaches and two horse boxes hit the bridge at speed after the driver had misread signals. The driver, who was killed along with his fireman and passengers in the first two coaches, had assumed that his train was taking the fast lines through Ditton Junction station when in fact his train had been routed onto the slow lines.